My family loves peanut butter cups and cupcakes, so combining them together is a taste bud party for them. 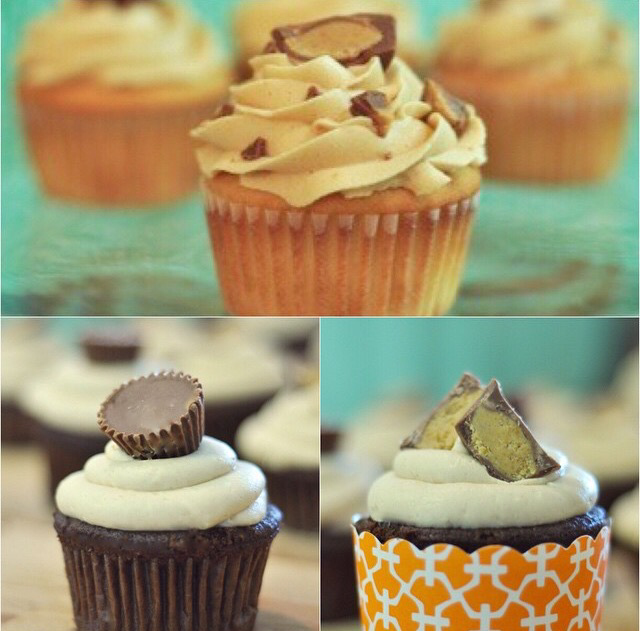 I’m not necessarily a huge peanut butter cup fan, however, even I can’t resist these cupcakes. The peanut butter cup inside is a fun surprise, the creamy peanut butter icing tastes perfect with either vanilla or chocolate cake. When my children were younger and could not take peanut butter to school, it was a huge treat to come home to these cupcakes. I hope you enjoy them as much as we do..
Disclaimer: these cupcakes can cause binge eating…. Prepare the cupcake batter as per the directions on the cake recipe or boxed cake mix. Peel the frozen small peanut butter cups and set aside. Freezing helps the peanut butter cups keep their shape while baking. While the cupcakes are cooling, mix up the Peanut Butter Buttercream icing. Top the cupcake with a generous swirl of icing. I like to cut a peanut butter cup in half and add to the top and then chop a few of the PB cups up to sprinkle over the tops of the cupcakes. So Delicious!! Even better on Chocolate cupcakes! !